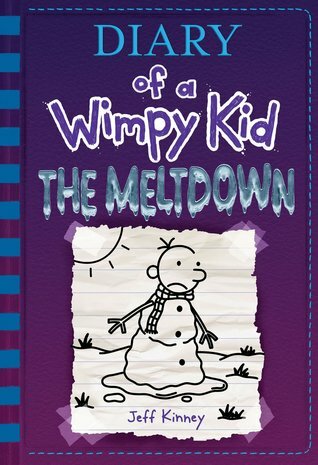 Greg Heffley is suffering through a winter very much like the one we have been having here in Central Ohio. Some days it is 50, but other days it is well below zero. There is some snow, but not enough for a snow day. Greg and Rowley have to walk to school, which is miserable. Being the creative types that they are, they try to find ways around the commute-- stopping by Greg's grandmother's house, getting pizza, or trying to get a ride on a school bus they think will take them close to their homes. Sometimes, they just have to try to fashion snow shoes out of pizza boxes and duct tape, although that doesn't always end well. It doesn't help that there is a turf war on Surrey Street, with the kids on the hill (where Greg lives) envying the kids on the bottom their flat spaces to play, while the kids at the bottom try to sneak onto the sledding hill. When there finally is enough snow for a snow day, Greg spend most of it trying to avoid his mother's chores and watching television in her bed, but he becomes bored with that, and ventures out into an increasingly violent snowball fight over the rights to the hill. Weaknesses: Greg's neighbors are named and described in very unflattering terms that come close to insulting. Also, as a conscientious reader, I tried to file that names away for when they might come up again in the book, but they didn't. What I really think: I just want more of a plot. Maybe a little character development. I'm not a book snob, but these are so highly anecdotal that I find myself longing for basic conventions of novel length fiction.